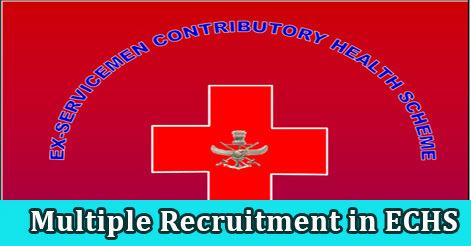 ECHS (Ex-Servicemen Contributory Health Scheme) Polyclinic Uttarakhand has released the advertisement for the recruitment of Medical Officer Post for ECHS Polyclinic Raiwala and Female Attendant Post for ECHS Polyclinic Tehri. These Posts are on purely contractual basis for 01 years. Interested candidates may apply on before 31 January 2019. Candidates will be selected on the basis of interview performance. Interested candidates send completely filled application form till 31 January 2019 at mentioned address below. The desirous candidates can check the official website www.echs.gov.in for more details and can call on 0135-2482004. The interview will be conducted on 04 February 2019 at 10:00 am. Candidate will bring original certificates, Degree, 02 sets of photocopies of all documents duly attested by GO as applicable and two Passport size photographs at the time of Interview. 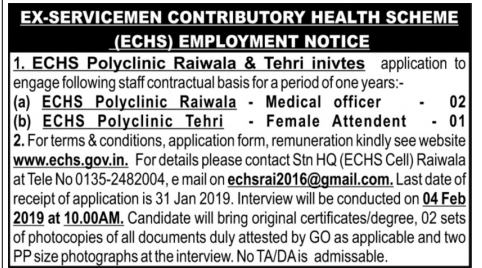 Help us to improve this article/job posting "Multiple Posts Recruitment in ECHS Polyclinic Tehri & Raiwala". We would be glad if you can comment below and provide your valuable suggestions and feedback. If this page have any wrong information/list or out of context content, then you can report us as well. Experience jaruri hai kya sir ? Sir My name is suresh prasad and i m retired from Indian Army on 30 Sep 2018. I have ADP course certificate with ‘A’ grading from Inf School Mhow and I have 12 Years long experience about IT Cell in Battalion.. So please if you have a any vacancy for me please contact me on this number …8414971775. Sir. I. Am. Rite. 31dec.2018pls.sir.connect.me.